Failure to abide by any safety rule may result in immediate revocation of range privileges. Treat all firearms as loaded, until you have personally inspected the firearm. Always keep your finger off the trigger, and trigger guard until your sights are on the target, and you are ready to fire. Be sure of your target, what is around, and beyond it. Be sure your firearm is mechanically safe. We can help with this. 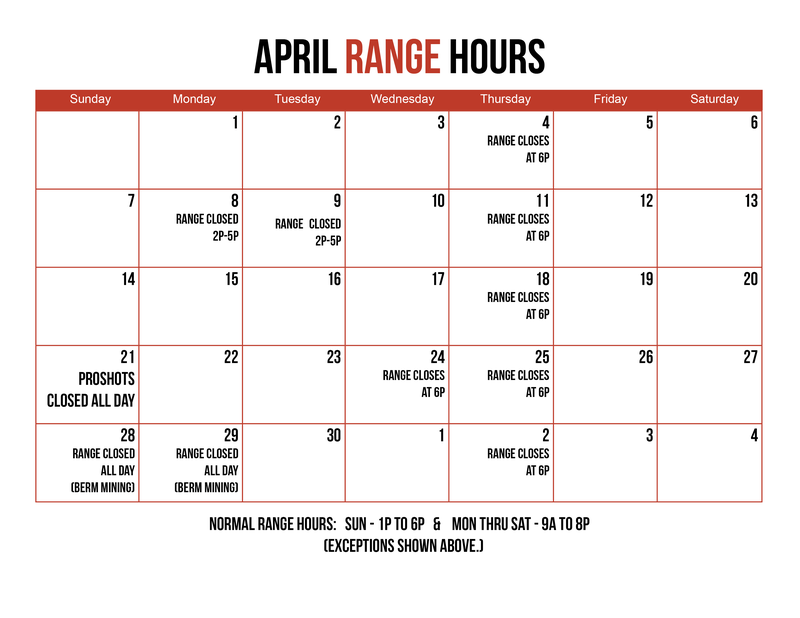 Our range is always a “hot” range, meaning firing can commence at any time. For this reason, everyone must remain behind the firing line at all times. Be sure you are using appropriate ammunition for your firearm. Do not expose ammunition to water, or solvents. Remember that the safety on a firearm is a mechanical device that can fail. Wear proper eye and ear protection at all times. Never handle firearms while under the influence of drugs, or alcohol. Store firearms in a manner that they inaccessible to unauthorized persons. When gripping a semi-automatic pistol, always keep both thumbs on the same side of the gun. If you don’t know why, ask us. If you don’t believe us, we have Band-Aids for you. If possible, engage the safety on the firearm. Do not attempt to correct the malfunction yourself unless you are competent in malfunction clearing procedures. Notify the Range Safety Officer if you require assistance. All federal, state laws must be obeyed. All firearms, and ammunition are subject to inspection and approval by ProShots personnel. All loading of firearms and magazines must occur within the confines of the shooting booth. When not in use, all firearms must be unloaded, holstered, cased, or locked open with magazine removed. All shooters must read the ProShots range safety rules and sign a waiver. Only one person may shoot at a time. Anyone under 21 shooting a handgun must be accompanied by an adult 21 years or older. Anyone under 18 shooting a long gun must be accompanied by an adult 21 years or older. We do not allow minors under 12 to operate a handgun. Food, beverages, and smoking are prohibited on the range. Muzzle loaders are welcome with modern smokeless powder only. Rapid Fire is NOT allowed without expressed approval by staff. Maintain at least one full second between shots, with the exception of double-taps. Rifles under 50BMG are welcome with non ferrous projectiles. If your bullet wont stick to a magnet, you can run it. Shotguns may be fired using slugs only. Commands issued by a Range Safety Officer (RSO) or range personnel must be obeyed immediately and without question. When the command”cease fire” is given. Remove your finger from the trigger guard. Keep the gun pointed downrange, and place your firearm on the bench. Then wait for further instructions from the range safety officer. Any shooter may call a “cease fire”. All firearms must be unloaded and benched/grounded, with the muzzle pointed down range. The action open must be locked open, the ejection port/cylinder up, and the magazine removed. Everyone must step back from the firing line behind the shooting booth. No one other than range personnel may go forward of the firing line unless authorized or instructed to do so by the range safety officer. Shoot only at approved targets, placed at eye level, to ensure that your shots strike the backstop and not the ceiling. If you are making “head shots” on your target, lower your targets on the backers to avoid hitting the range ceiling. Firing across lanes is prohibited. Firing from the draw, as well as shooting from prone, is prohibited without approval of staff. The shooting bench from the shooting stalls may only be removed with approval of staff. You may only collect the brass that is in your stall, or behind the firing line of your stall. Brass from other shooters, and all brass that falls in front of the firing line may not be collected. When finished shooting, please use the provided squeegees to push spent brass onto the range floor. No firearms or live ammunition are permitted in the classroom except as directed by range personnel. Safe gun handling procedures will be exercised at all times in the classroom.